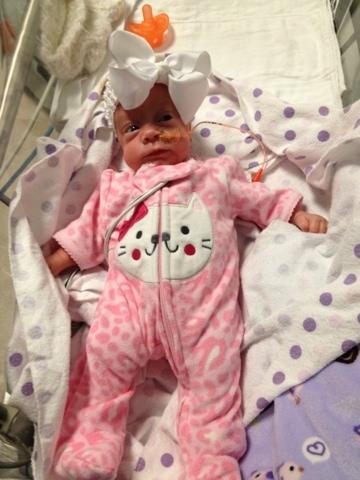 Briella's Journey: Look Ma, No Oxygen! So another 1st today. This morning Miss Briella was taken off oxygen! She hasn't had any spells either!! The only thing left is her feeding tube. That will stay in until she masters the bottle. The 1st bottle today she drank all but 12 Mls. The PM bottle she drank about half. She is now at 42 mls every 3 hours. We now have to make each bottle with half formula since she has out drank my home stash of milk. 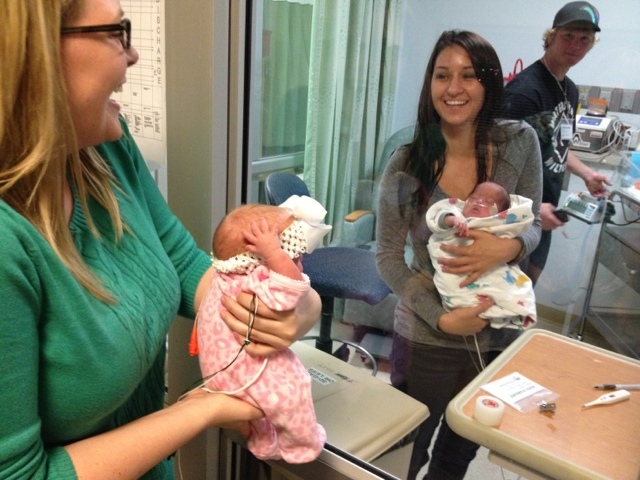 The nurse practitioner makes daily rounds to each baby. Tonight she came in at 6pm. She said it is so great that Briella is now her last baby that she sees. Before, Briella was one of the firsts seen in the morning because she was so frail. Tonight was a big night for Briella socially. She got all prettied up, put her big bow on. We opened the curtains between Briella and her neighbor. I might have referred to him before as her boyfriend. He was born about the same time and was also a micropreemie. Both me and his mommy held the kids up to the window that separates their room and let them see each other. Briella was smiling and blowing kisses. Okay she had her hand on her mouth but it looked like blowing kisses. Her boyfriend slept through it, but we have the pics to prove the first date :) What a fun night we had! And to top it off we have had our most favorite nurse back the last two days! Can you see that the oxygen tubes our gone?! The picture of Briella and her boyfriend is adorable! If the hospital was smart, they'd use it in marketing material! What beautiful babies! Thank you so much for continuing to share Briella's journey with us!